A felony charge has been refiled against an anti-wolf activist accused of illegally killing a trophy bull elk last year in northern Blaine County. Tony J. Mayer, a 59-year-old Twin Falls man and founder of the anti-wolf website SaveElk.com, is once again charged with "flagrant unlawful killing and/or possession of a trophy bull elk," a crime punishable in Idaho by up to five years in prison and lifetime loss of hunting and fishing rights. The charge is the same as the one dismissed against Mayer last month in Blaine County Magistrate Court. Judge R. Ted Israel ruled at the conclusion of an Oct. 20 preliminary hearing that the Idaho Department of Fish and Game had bungled a test on the size of the elk's antlers to determine if the animal was of trophy status. "We have had the antlers remeasured by a Boone and Crockett expert and believe all of the elements of the crime are present to proceed with the felony at this time," Blaine County Prosecuting Attorney Jim Thomas wrote in a statement Thursday to the Idaho Mountain Express. "We will continually reevaluate the case as it proceeds in the system to determine the most efficient course to follow in seeking justice." Boone and Crockett is a sportsmen's club that establishes standards for determining trophy status of elk and other game animals. Mayer is accused of killing the elk out of season and without the proper permits. He is also charged with the misdemeanor crimes of hunting without an elk tag, hunting without an archery permit and unlawful possession of protected wildlife. 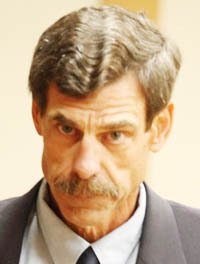 Prosecutors and Fish and Game allege that Mayer killed the elk "on or about" Oct. 3, 2009, in the Alturas Lake area of northern Blaine County. The bow-hunting season had ended in the area three days earlier on Sept. 30. Investigation started after Mayer posted a story about the hunt on the popular "Bowsite" website and details of the story aroused Fish and Game suspicions that the elk was killed illegally. The story has long since been removed from Bowsite, but the Express was able this week to obtain a copy. The story was posted on Bowsite on Oct. 5, 2009, and recounts the hunt that Mayer wrote occurred "last week." He claimed to have first shot the elk on a Friday and to have shot it a second time the following day. Mayer wrote that he took his family to the Stanley Basin area on a wolf-hunting excursion. "I intended to hunt wolves, but I was also prepared to hunt archery for elk," Mayer wrote. "After two days wolf hunting and finding nothing in areas where I had seen numerous wolves in the past few years, I decided it was a waste of time to continue hunting wolves until there was a weather change (easier to track wolves in the snow). I elected to go bow hunting instead since I had seen elk the previous day." Mayer wrote that "early Friday morning" he "sat camouflaged on top of a ridge" watching a small herd of cows. He followed the herd when it started moving "into the pines." "I was quietly stalking through the trees and looked up and within 45 yards from me stood a nice bull that was evidently checking on his cows. As it moved forward, I could tell that it had a nice rack." Mayer wrote that he took a shot, the bull ran off and he wasn't sure that he'd hit the animal until later when he was following it and found traces of blood. Mayer wrote that he followed the animal for most of the rest of the day but couldn't get close enough for a second shot. He wrote that the elk seemed, however, to be getting weaker from the wound. He resumed tracking the animal the next day, and got close enough around 11 a.m. for another shot. "He was weak and staggering, but still had some life," Mayer wrote. "He was trying to find an access point to cross the creek. I quickly loaded up and let another arrow fly, hitting him just below the front shoulder. He tried to jump but instead stumbled into the stream. "I ran up and found him trying to swim but his massive head was under water and he couldn't lift it up. He appeared to drown. "I couldn't believe it—the trophy elk that I've been hoping for years!"